To the Great Emperor of the German Empire. The war in Europe is a matter that does not concern us, the Chinese people, and as Your Majesty knows the world is full of people with greater talents than we have. However, as the ancients have said, a model emperor would be a brave warrior and merciful: however, if one loves war for its own sake and treats human lives as blades of grass, you will invoke the anger of the gods. We Chinese came to Europe as neutrals, our aim is to make a paltry living; however, the war made our journey to Europe somewhat less than peaceful. This letter to Kaiser Wilhelm II was written by a Chinese labourer named Yuan Chun. No one knows if it was actually ever sent to the Kaiser. The text quoted above was transcribed into a notebook which is preserved in the archives of the Imperial War Museum in London. But as a voice from the time it tells us something of the attitude of an ordinary Chinese man who was working behind the Allied front lines in the closing years of the First World War. 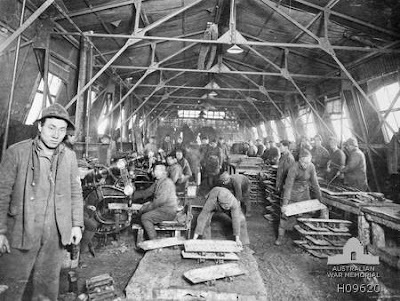 He was one of some 135,000 similar men who worked as contracted labourers, mainly in France – but also in other parts of the global conflict zone. They didn’t fight – at least not in the sense of seeing active combat, they weren’t soldiers – but they did help the Allied war effort by digging trenches, filling sandbags, loading and unloading supplies from ships and trains; as well as undertaking more skilled labour, such as repairing tanks and artillery. After the war, completing the full terms of their original work contracts, they stayed on into the early 1920s and played a vital part in the recovery efforts – they repaired roads, cleared the battlefields of unexploded ordnance, collected the bodies of the dead, dug the neat rows of graves in the vast cemeteries; indeed, some were skilled stone masons who carved the distinctive white headstones. And yet now, almost one hundred years on, they are almost all but forgotten. Very little mention has been made of them or their undoubtedly important contribution to the Great War in the official record or the many histories of the conflict which have been written in the years since 1914-1918. Indeed, until very recently I could only find one book which looked at the British Chinese Labour Corps (CLC), and that book was privately published and so hard to find. But happily, perhaps with the approach of the Great War’s centenary, over the last few years a number of works have begun to appear (some of these new titles are listed at the end of this piece). Other efforts are also in process with the aim of raising a greater awareness of the involvement of the Chinese labourers, as well as initiatives to ensure that recognition is suitably preserved thereby commemorating the hardships they endured and the great sacrifices they made – many of the labourers were laid to rest in war cemeteries across the globe (particularly in France), looking identical to the graves of the soldiers their work supported. 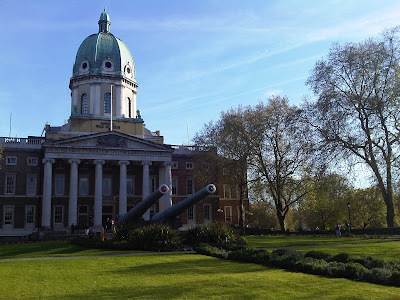 Earlier this month, on May 4th in fact, I attended a one day symposium at the Imperial War Museum, organised by Anne Witchard of the University of Westminster, entitled: China & The Great War. 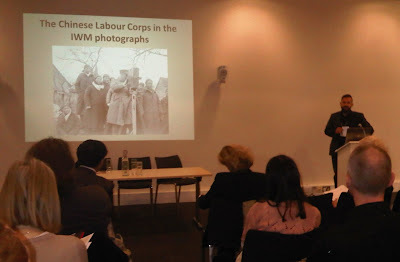 A number of academics spoke on different aspects of the Chinese labourers (and the British Chinese Labour Corps in particular), sharing resources and giving insights into new topics of current research, with interesting and challenging discussions following on from most of the presentations. Paul Bailey (University of Durham) began the day with a paper entitled ‘From “Coolie” to “Transnational Agent”,’ looking at contemporary discourses which have centred on the Chinese labourers within China, attempting to place these in the context of broader global labour movement studies of the period. 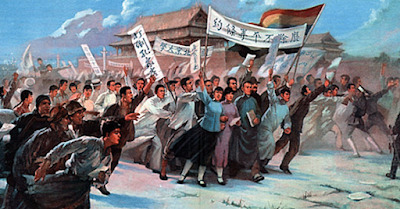 The Chinese involvement with the First World War came at a pivotal moment in China’s national history, with its transition first from a monarchy to a republic, then through civil war to the socialist republic that it is today (with exception of the island of Taiwan, which still remains under the political control of that first Republican Government). Hence the significance of this key moment in China’s history subsequently remains a real problematic for China’s national discourse even to this day. Paul Bailey’s talk paired neatly with a later talk given by Xu Guoqi (Hong Kong University), and sparked a lively debate in the questions afterwards, asking “what is China?” and “what is Chineseness?” – questions which form the focus of Xu’s current research. As already noted, the Great War came at a crucial time when China was in the process of redefining itself in response to pressures from within, but also overwhelmingly due to pressures imposed from without as the forces of Western imperialism, which had been increasingly encroaching on China’s sovereignty since the 19th century, were now pushing China almost to the brink of break-up and dissolution. Hence too, the significance of the date on which this symposium was being held – May 4th, with its historic, student-led uprising on that date in 1919. 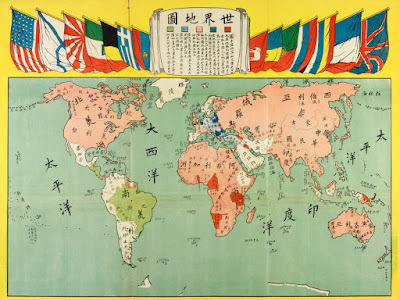 If China needed to reshape itself in the wake of the Great War, particularly given the disappointing outcome for China of the Treaty of Versailles, in order to properly join the global community of nations on an equal footing, how should it define itself? – In that sense, Chinese society at the time was asking itself – what essentially is this unique notion of “Chineseness” and how should it inform China’s new ‘geopolitical’ identity? Elisabeth Forster (Oxford University, China Centre) continued this theme with her examination of the “New Culture Movement” which arose from the events of May 4th1919, largely shaping the “brand of modernity” which we find very much embodied in the China of today. Examining the role of contemporary newspapers in bringing together the students and academics of the May 4th Movement with the popular embrace of the ideas informing the New Culture Movement raises interesting questions concerning the connectedness of culture and politics at the time, perhaps highlighting how Confucian notions coincidentally became allied to the popularisation of Marxism and the rise of ‘plain language’ (baihua) in ordinary Chinese society. Other talks given as part of the symposium largely focussed upon the British Chinese Labour Corps. 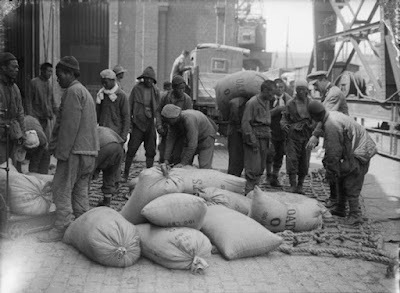 Established by the British Government in the closing years of the conflict, with the approval and encouragement of the then Chinese Republican Government, the British War Office recruited a force of some 96,000 labourers who were transported to Europe and Africa to work under contract ‘safely’ behind the lines to support the war effort, thereby freeing-up able bodied servicemen to concentrate on the business of fighting at the Front. By no means soldiers, paradoxically these men were drilled and lived under army rules and strict discipline in closed camps under the charge of British military officers. As such, and despite such a narrowly regimented work system, these men still retained their own sense of self-worth and often collectively organised themselves to take action when needed to assert their rights, for instance through organised protests or strike action (a fact which has since proved problematic to those who might wish to portray them wholly as victims of Western imperialism). Mauriuz Gasior (Imperial War Museum) gave an introduction to the IWM’s photographic archives, both official and unofficial, relating to the CLC – prompting helpful discussions over some of the descriptive captions accompanying the documentation of some of these images regarding the activities and details they depict. Laura Spinney (independent science writer & journalist) gave a fascinating insight into the Spanish Flu pandemic of 1918 (which killed more people globally than each of the two World Wars put together), examining how this might or might not have been connected to the movement of US soldiers and/or the Chinese labourers and the camp-life to which they were each largely confined as perfect containment and breeding grounds for Spanish Flu. After which Gregory James (University of Exeter, now retired) gave a surprisingly exuberant analysis of the statistical realities of the number of Chinese fatalities which occurred. Using the enormous figures frequently claimed in the media as his launching point he then proceeded to elaborate the documentary records which belie the realities concerning the fatalities which occurred among the Chinese labourers during the war and in the years immediately after when they were still under contract. He has done this by means of an exhaustive trawl through the official War Office records, correlating them alongside other primary sources, such as the records of the Commonwealth War Graves Commission, ship’s records, and the like, in order to produce an impressively detailed and comprehensive computerised and searchable database. This dataset reveals that the number of Chinese who were killed or died by other causes during the conflict aren’t anywhere near as high as some of the inflated claims of around 10,000-20,000 (even 30,000 in one instance) with the actual estimate being closer to somewhere around 5000-6000 – although, given the gaps, potential errors, and mismatches in the records, ultimately the real figure will probably never be known. This database is clearly an important historical resource, but sadly at present it is not publicly accessible; during the final Q&As the audience expressed the hope that this resource might eventually find a suitable home at some point in the future, so that this valuable dataset isn’t lost. Initially I was drawn to the topic of this symposium as the result of a tangent to my own on-going research. I’m very interested in the British Consular Service in China as well as the Chinese Maritime Customs Service, and many of the personnel of both institutions ‘joined up’ in order to contribute to the war effort by serving with the CLC. 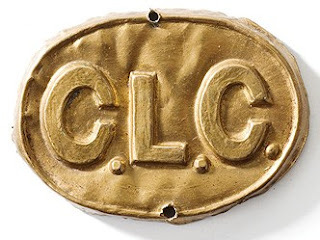 Their language skills and their cultural knowledge of China was seen as a key element in the smooth functioning of the CLC battalions, with many of them teaching fellow British Officers basic Chinese language, as well as liaising with and organising the labourers themselves. Several of the British consular officials I have been researching, including Louis Magrath King, served with the CLC in France. His father, Paul Henry King, who was based at the Maritime Customs office in London at the time, even facilitated and organised the sending of Chinese musical instruments to the CLC labourers in France for their recreational amusement, hoping to help them feel less far from home. Hence, this study day helped broaden my knowledge of the topic and gave me a number of insights and pointers to resources which might be of future use if I am able to expand and make something concrete out of the few things I’ve found so far in the official archives. Who knows – watch this space, as they say! Two films were shown during the course of the day. The first, which was screened in the middle of the event (just after we returned from a fantastic buffet lunch), gave some background to the ‘Ensuring We Remember’ campaign which hopes to establish a permanent memorial to the Chinese labourers, as well as efforts and initiatives to promote education and better awareness. 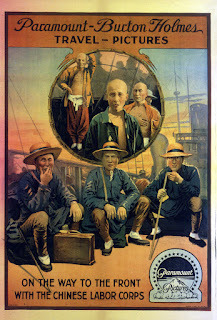 The symposium was rounded off with a short documentary film about a play, The Forgotten of the Forgotten, which the theatrical creative team at ‘Moongate Productions’ hope to develop, similarly to shine a greater light on the Chinese labourers, their crucial contribution to the Great War and the sacrifices entailed. See a trailer for the play here. The symposium was an interesting and enjoyable event which was clearly very useful to all those who attended it. Warm thanks are due to Anne Witchard. I’ve attended a number of conference events which she has organised, particularly her ‘China in Britain’ series at the University of Westminster, and I’ve always come away from her seminar events with masses of useful notes, piles of new contacts, plus heaps of new ideas and inspiration for my own research. See the 'Translating China' website. To mark the centenary of the Great War Penguin have published a series of ‘Penguin Specials’ which are short books examining various themes and topics relating to China and the War of 1914-1918. I’ve read quite a few of these and they do make very good and highly readable (accesible rather than heavily academic) introductions. Find out more about the series here. Click on any of the images above to follow a link to its source, if not my own photo.